When migrating one Exchange organization to another organization you have to do quite some work. The traditional methods include a lot of scripting, or a 3rd party tool like Quest or BinaryTree to migrate one Exchange environment to another. 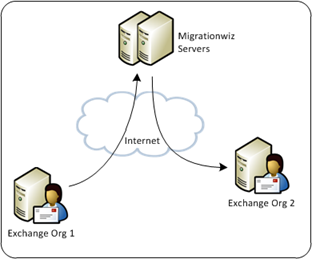 Migrationwiz is a product that can perform the migration from the cloud, they offer E-mail migrations as a service. This migration can be from any messaging platform to any messaging platform, but for this blog I’ll focus on a migration from one Exchange platform to another Exchange platform (in different datacenters).